Complete with "Its own framework"
• Each Door comes pre-hung with frame. • One Piece door frame is manufactured out of 2 x 4 tube. 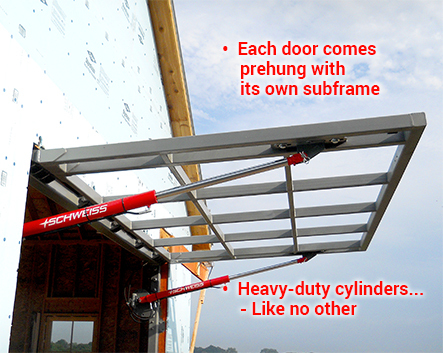 • Pre-assembled, pre-welded and delivered pre-hung within its frame for ease of installation. All Schweiss hydraulic doors are factory welded and made of structural steel tubing. The doors are hinged horizontally at the top of the frame using heavy duty hinges by each upright tube on the door frame, which evenly distributes the load onto your door, building, truss and header. 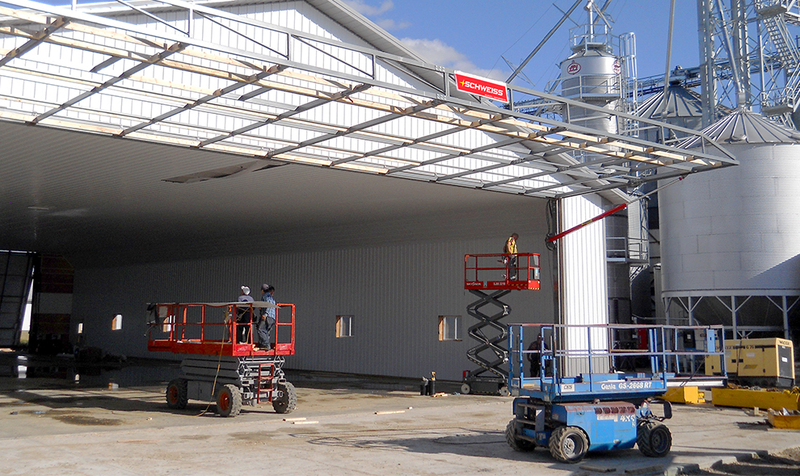 Hinges are factory pre-located to align with the building and truss members. The door swings outward, away from the building. In the open position, the door will be laying flat at 90°. Doors are trussed to provide extra strength. Extra metal in the right place reduces the bowing or sagging when the door is open or closed. Each door is fully assembled from the factory, saving you hours of installation time. All of our doors are manufactured with webbed trusses to provide extra strength. The truss is located near the very bottom of the door. We have two styles of trusses. • Placed on the outside of door frame. • Visible from the outside of the door/ building. 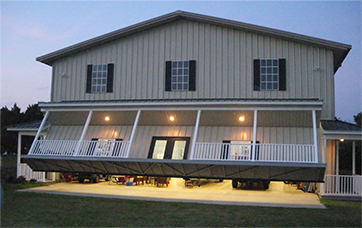 • Optional: A raised external truss available. • Placed on the inside of door frame. Nice clean look. • Cannot be seen from outside the door/building. • Weather elements are not a problem. • Additional headroom required with this style. Hinges are mounted on a self-supporting, pre- mounted, continuous header tube. All hinges are self-contained on the door frame which makes the door easy to install. Hinge pins are 1" diameter attached to 3/8" thick hinge plates. Hydraulic doors are opened with two hydraulic cylinders. Located on each end of the door. Schweiss provides extra heavy duty cylinders that will give you many trouble free years of operation. • Hydraulic door come with a sub frame, the cylinders are attached to the vertical sub frame members on each side of the door frame. • The doors vertical sub frame members attach to the buildings door side columns. 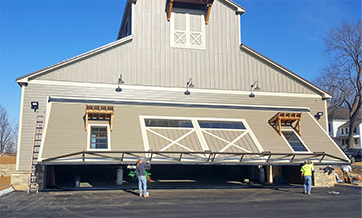 • Schweiss offers multiple sizes of vertical sub frame members where additional strength is required on your existing building for added strength! 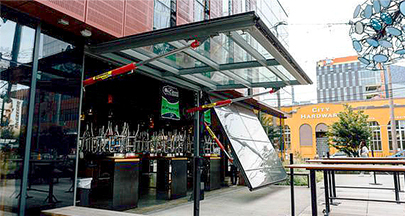 • Hydraulic doors come with a sub-frame, the horizontal sub frame member comes full width of the buildings clear opening. • Horizontal continuous tubular member - has pre-drilled bolt holes for easy installation to the building structure being stub columns or a continuous header supplied by the building company. • Horizontal continuous tubular members is are .pre-welded to the vertical sub frame members that the hydraulic cylinders attach to. • Heavy duty hinges... are pre-welded to the door frame & horizontal continuous member for ease of installation. 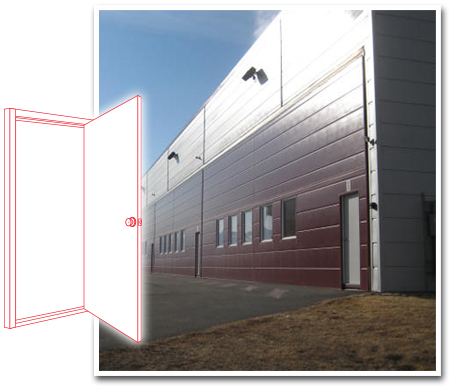 The walk door feature saves indoor building space and keeps all openings in one location. We build the walk door framework into the Hydraulic Door. We use factory aluminum or steel walk doors of your choice. All walk doors have a keyed cylinder lock. Also available is keying multiple doors with a master key. We offer a 16" x 16" window within the walk door. Also we can paint the walk door to match the building. 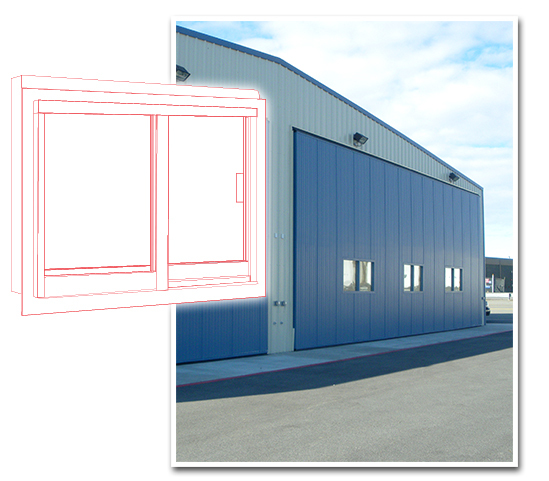 • When installing a hydraulic door on an existing building, try to match the door sheeting with the building sheeting or substitute other materials. • We can provide a self-drilling tec screw with a neoprene washer to apply any type of sheeting to your door frame. We offer special color screws to match your sheeting. • External door sheeting & trims. • Many colors to pick from... your choice. • Inside liner sheeting doors may be finished off with sheeting. • Alternate exterior siding / skins. 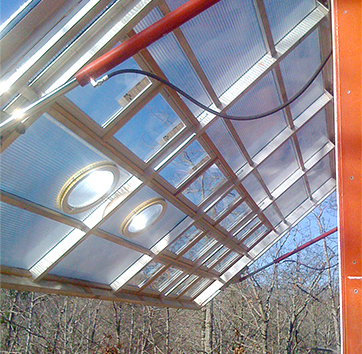 We offer a single or double insulated window, fixed or sliding. Commercial grade. Sizes are 36" x 48". Many other sizes available. All windows have screens and slide open. Windows may be placed at any height or location. Allows plenty of natural light into your building. • Specialty windows are catching on fast. They really sharpen the appearance of your door and building project. They can be made to mirror the rest of the building structure, and adds a neat appearance. • Windows - Any size, quantity and placement a your choice. • Windows - Insulated / screens / sliders. • Windows - Frames only. We have the reputation for creating distinctive, custom designer style doors. With your thoughts, and our door expertise, together we will design the ultimate door for you to exactly match the designer door of your dreams. If you can think it, we can make it. Let your imagination run wild, as we begin with the best, and move higher, exceeding every expectation. 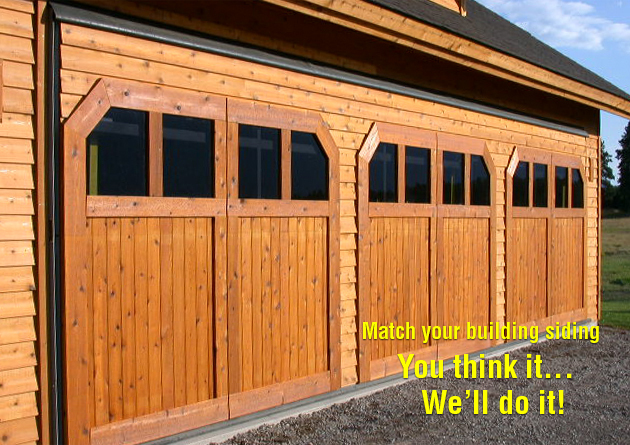 We don’t just build our doors for anyone - we build our doors for only one - You! To give your door a finished look on the inside, we offer an inside liner kit for doing only the inside bottom half or the entire inside frame. We furnish a 12" rubber boot that seals the bottom of your hydraulic door. The heavy 2-ply, cloth-inserted rubber seal provides excellent weather proofing. and seals should be placed accordingly. This same continuous rubber seal can be used at the top of the door to prevent flow of moisture into the door or building. The Hydraulic Door is made very weathertight. The sides of each door are sealed off with a special weather stripping. The entire door perimeter can be made weathertight. • We design our door to accept the insulation of your choice. • Solid - R - board 1-1/2" thick or more. • You can place the insulation between the door frame and the outside sheeting. • You can place it between the door frame members. • The thicker the door frames, the more insulation you can apply, for a better R factor.